Harry Hart (Harrison Pro Hart) was born in 1999 and is the son of David Hart and grandson of the late, Pro Hart M.B.E. Harry has become well-known since being in the Stainmaster Carpet commercial released in 2010 where he plastered food all over the carpet and turned it into an amazing Dragonfly. Harry can be seen boogie boarding across spaghetti and using toys including a water pistol, a pair of jumping boots and a remote-controlled car to apply the brushstrokes to his canvas (the living room carpet). This commercial promoted a new generation of carpet since Pro Hart first did the Stainmaster Carpet commercial in 1997. Harry went on to produce many other segments for the Stainmaster Carpet which can be seen on their website. In 2010 Harry appeared on Hey Hey it’s Saturday and painted live. The painting was auctioned off and sold for $10,000 and 100% of funds were donated to a charity. In 2011-2015 Harry continued to be the face of the Stainmaster Carpet, starring on their website the “Ask Harry” segments as well as featuring in many Australian and International magazines. In 2016 they created a new Stainmaster commercial by combining both ads with Pro and Harry. The ads can all be seen on YouTube. It appears that not only was Pro’s remarkable talent passed onto David, but it would seem that talent definitely flows down from generation to generation, now with Harry being the youngest of the Hart clan, to become a collectable artist. 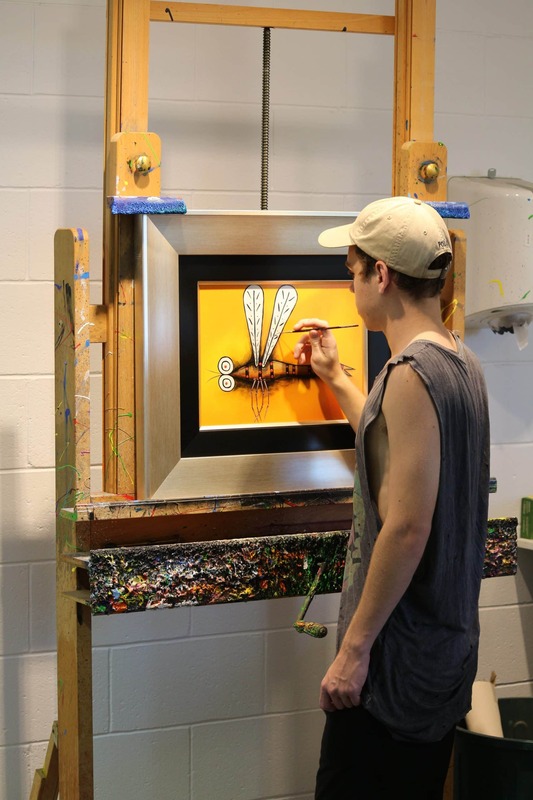 Since the commercial, Harry has had many requests for commissions so together with his father he has produced a range of his own style of Dragonfly. These works have been selling very well, ensuring an artistic career for the youngest Hart. Over the years Harry has had huge media attention and has had many stories printed in the media. In 2016, Harry completed his Graphic Design course and is now a Graphic Designer and Marketing Manager at a well-established IT company in Brisbane, where his creative ability continues to expand to new expressions and mediums.